Enjoy the benefits of organization! For over three decades, Closet Factory has been creating custom storage solutions for the entire home - from closets and home offices to entertainment centers and garage cabinetry (and more). Our collaborative design approach and industry-leading range of products allow you to bring your vision for your home to life. We design with best practices and build with the highest quality materials so that you receive a personalized system that is perfectly functional, completely organized and totally stylish – all within a budget you are comfortable with. Closet Factory is also known as the “Professional’s Choice,” servicing home builders, interior designers, realtors, and more! •We are fully custom with in-house manufacturing facilities across the country. •We provide assurance by showing up on time, and doing the project right, when expected. •Our trained installers are employees, not contractors. •We are fully insured and ready the moment we step onto a property. •We can complete spaces for the whole home so your own workers can focus on trim and other details. •We add value to homes by maximizing space usage and increasing storage capacity. I believe there is no "one size fits all" organizing template. Each client is different; so a different system needs to be set up for the individual based on their exclusive personal needs. Some clients want to establish "homes" for all of their stuff, some want to better understand Feng Shui, some want an aesthetic eye and some ....simply an eye for order. Closet Solutions is located in the Los Angeles, South Bay area. We are an individually-owned and supervised business. Our team has over 50 years of combined experience designing and installing attractive, functional, innovative custom storage solutions. From walk-in closets to reach-in closets, garage cabinets, home office or pantries, Closet Solutions offers the best value in the custom storage industry. You are assured of top-quality designs and workmanship, the highest standard materials, and competitive pricing. But most important you're assured of on-time, efficient installation, meticulous craftsmanship and the best service in the industry. We treat your project as if it were for our own homes. 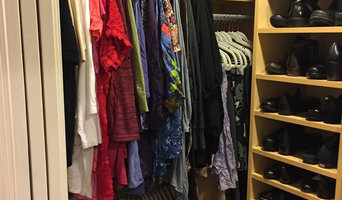 We want to hear you say "I love my new closets!" Because we know satisfied customers are the true cornerstone of our success. IT’S ORGANIZED is dedicated to solving your organizational issues with practical, creative, and sustainable solutions for your home and office. From redesigning closets and pantries, to creating usable storage in playrooms and offices, to installing garage systems, we tackle any challenge. Our design team and professional organizers will help to create a productive and stress-free living environment for you! Jennifer has been transforming spaces for many years. She has an eye for space, design and practical use of space. She can use existing elements in a space and make recommendations as well as shop with clients if necessary either online or in person to create the most functional and beautiful aesthetic. Most Interior Designers start from scratch and design a space with entirely new elements. Jennifer repurposes existing elements and furniture to transform the existing space and elements to a redesigned space. Jennifer is a visionary who cultivates the space taking into account the Clients needs and preferences and comes up with a vision that is inspiring and pleasing to the Client. She works with all budgets and can create high end beautiful aesthetics for minimal cost. Jennifer also reorganizes the "insides" of a space. She will take the client through the "purge" stage with certain guidelines and philosophies that have proven effective. Then she reinvents the internal layout so that function, accessibility and aesthetic are considered. Abbey Claire is a professional organizer serving The San Gabriel Valley and surrounding areas of Los Angeles. She can help you take control of your space and free your mind. Abbey works with her clients to create a home/work environment where they can function. Together they develop systems to keep things “in order” and banish chaos. Her ideal client is someone whose life has gotten in the way. Busy moms, busy professionals and anyone in between who doesn’t know how or where to start. If this sounds like you then you’ve come to the right place! Abbey will help you find the best solutions to get you organized and keep you that way! She works with her clients to create a home/work environment where they can function and develop systems to keep things “in order” and banish chaos. Design & Order is a Professional Organizing and Interior Design company offering distinct solutions for work and home. Our solutions are designed to accommodate the individual wants and needs of our clients while bringing order, beauty, and inspiration to their environments. Our DIFFERENCE is in the details... With Our Clients... We respect our clients, their belongings, and their privacy. With Our Work... We take great pride in every project and every detail. With Our Team... We work together to promote our strengths, and to be our best. With Our Partners... We are honest, dependable, fair and loyal. With Our Environment... We practice and promote sustainability. With Ourselves... We let our passion shine through in all that we do. Professional organizer serving homes and offices all across the U.S. for over 30 years. Speaker Author of 10 books on organizing including New York Times bestseller "One Year to an Organized Life." Born and raised in the suburbs of Indianapolis, Indiana, Deanna grew up with an extended family where she learned the art of having many homes as a quiet place to find comfort. Deanna was raised with a stay-at-home mom who had an eye for home decorating and unique skill for organization and cleanliness while offering to help other mom and families in the neighborhood do the same. Deanna’s manager at West Carolina Inc. had a keen eye for lighting, coloring, and antiques, where she learned and developed her own sense of style and design. Interior Door & Closet Company is the #1 interior door and closet installation company in the United States. We provide complete home transformations to Los Angeles County by replacing interior doors, closet doors, closet organizers and shutters at affordable prices. Interior Door & Closet Company was featured on the hit TV show, Extreme Makeover: Home Edition. Now these award winning doors and closets are available to LA homeowners. Currently, we are offering brand new interior doors for as low as $129 per installed door. We have the largest selection of doors in all of California, so finding the right style is not a problem. And because we measure and cut all our interior doors by digital machinery, every door fits perfectly. Our designers have over 25 years experience and our prices are up to half that of a home improvement store, contractor or handyman. Above all, our process is so easy, we complete whole homes in less than a day. Organize2Harmonize is a professional organizing company. Services provided include home organization, closet design, home inventories and coordinating household moves. 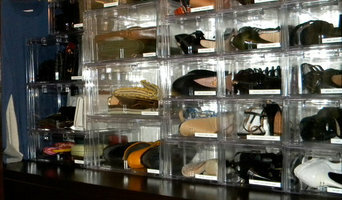 We organize everything from closets to kitchens to home offices to bathrooms to garages, etc. Any room with clutter can be put in an orderly fashion to create a comfortable environment. When we prepare for a household move, the client can leave one home and arrive at their new home with everything done for them. They can move right in without the added stress of organizing their new space. Let us create harmony in your life! Little Simplicity incorporates the lens of both a designer & an organizer. We help individuals and businesses take control of their surroundings, their time, and their systems for life, while designing the ideal environment to thrive. My goal is to bring simplicity to your life. Let's figure out what you're doing right and what needs work so I can tweak it. I will personally handle as much and as little that is needed. I love my job more than ever and look forward to every new challenge that comes my way. Creating Clarity is committed to creatively organizing your storage and living spaces. If you feel bogged down with a messy home, disorganized papers, embarrassed by your living space, living with ADHD, hoarding, tired of losing things or just need more time in your day give us a call. Tia Shackelford Interiors (formerly, 'Room Designs By Tia') is a full service Interior Decorating, Interior Redesign & Home Staging company that provides services to residential (including home sellers/buyers), and small business properties. We create interiors that are harmonious, sophisticated and functional. We specialize primarily in nursery and child spaces. We handle renderings, and space planning for these designs. We work closely with our clients to transform and improve living spaces into beautiful, more functional designs that enhance their lives. With Room Designs By Tia, each project is handled with comfort and individuality and we pay close attention to detail. Our company provides an extraordinary level of customer service to its clients. Services Provided Interior Decorating & Redesign, Redesign Consultation, Home Office Interior Decorating, 3D Rendering, Decluttering and Organizing, Kids Bedroom Design, Nursery Design, Teen Bedroom Design, Master Bedroom Decorating, Home Staging, Linen Closet Organization/makeover, Bathroom Decorating/design, Dining Room Decorating, Express (1-Day) Decorating, Shopping for furnishings and accessories, Interior Redesign Consultations for Do-It-Yourself Clients, Custom Art Work, and E-Design.